Some local high schools are playing their first varsity football games of the season tonight. Wow, wasn’t it just graduation season? I’m designing all kinds of team spirit necklaces for the fall sports kick-off. So all you football, cross country, tennis, volleyball, soccer, cheerleading, swimming, and diving boosters can show your support for your favorite athletes and teams. Great for fund-raisers, silent auctions, team gifts, and coaches too! I grew up in Colby, Kansas, where they love their Colby High School Eagles, and their orange and black. That’s what’s pictured on this post. I grew up in Colby, but actually graduated from another Kansas school, the blue and red Russell Broncos. We have some great schools and great rivalries around this area too: the Chanhassen Storm (navy and vegas gold), the Chaska Hawks (purple, white and gold), the Holy Family Fire (forest green and cream), the Minnetonka Skippers (royal blue and white), the Eden Prairie Eagles (scarlet and black), and the Shakopee Sabers (red, white and black). Personalize your own piece with player numbers, sports or mascot charms, names, initials, graduation year, whatever you want! What was your school mascot? Leave a note in the comments, I’d love to know! 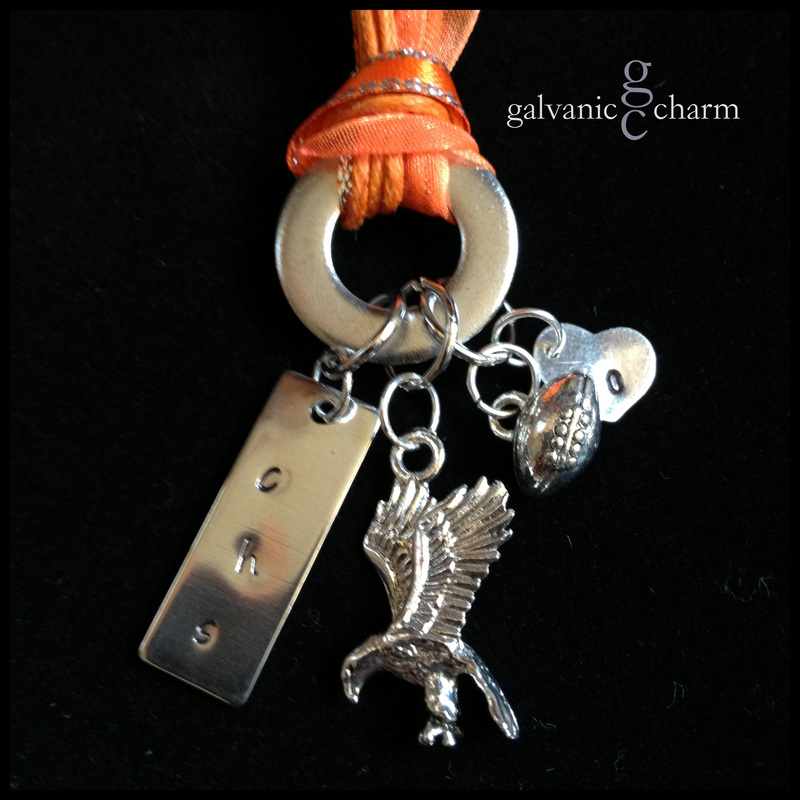 EAGLE – Booster necklace with hand-stamped stainless steel tag and sterling silver heart tag, and pewter eagle and football charms hung on a round washer. 18″ orange ribbon with stainless steel chain and lobster clasp. $20 as shown.